There are lots of coach holiday firms offering Royal Edinburgh Military Tattoo coach holidays that include tickets to the event, transport and accommodation. For example Shearings coach holidays, Gold Crest and Leger holidays are three that offer excellent Tattoo & Festival breaks by coach. This way you can sit back and relax knowing that it is all taken care of for you. 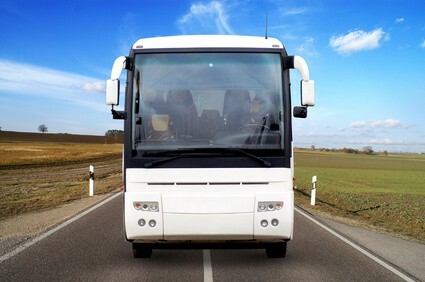 To get around the accommodation problem of expensive prices and availability that happens in Edinburgh in August, coach holidays offer a great solution. Rather than pay expensive prices to stay in Edinburgh coach holiday firms sometimes use accommodation near Edinburgh and provide coach transfers to and from Edinburgh for the Royal Edinburgh Military Tattoo. Also on at the same time as the Royal Edinburgh Military Tattoo is the Edinburgh International Festival, a world famous annual festival of performing arts and generally lasts about three weeks and starts in the middle of August. If you time your visit to Edinburgh you could take in so much more by simply picking the dates of your stay carefully. There are also a number of other Edinburgh festivals on in August as well and one the most famous ones is the Edinburgh Fringe which has grown to be the worlds largest arts festival with events running over 25 days. Shows vary in type and there are even a large number of events, which offer free entry. With all these festivals going on in Edinburgh accommodation can be hard to get especially at affordable rates. If you are planning on going to see the Royal Edinburgh Military Tattoo then you need to act quickly and organise your tickets, accommodation and travel tickets. Any one of these could be hard to get a reasonable price so as an alternative to all the hassle have a look at the options for the Royal Edinburgh Military Tattoo coach holiday. 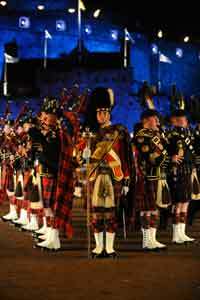 The Royal Edinburgh Military Tattoo takes it's name from the cry of Inn-keepers in Holland and Belgium. Over 300 years ago when the fifes and drums of the local regiment marched through streets to signal a return to barracks. 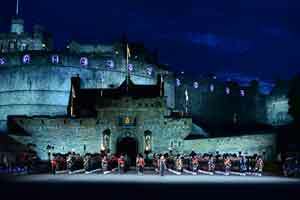 The Military Tattoo in Edinburgh has been held on the Castle esplanade since 1950 when just 6,000 people attended to watch just eight items. Amazingly not a single performance of the Tattoo has ever been cancelled do far! Around 1000 performers take part in the Tattoo each year from over 40 countries from all over the world. There are lots of rehearsals to make sure that everything goes according to plan. Getting things ready for the Tattoo, include full dress rehearsals and up to four days of practice as well as this preparation shows when you see the amazing final results. This is just another reason why the event has been sold out many years running in advance! The Tattoo is performed every weekday evening and on a Saturdays there are two performances throughout August.. The second Saturday night performance normally includes a spectacular Fireworks display. The event has never been cancelled due to inclement weather.